MEXICO CITY (CNS) — Mexico is mopping up after Hurricane Patricia hit its Pacific Coast with Category 5 strength, but left surprising little damage and few deaths, given the severity of the storm. An official with Caritas Mexico, the church’s charitable arm, says the storm left a mess in parts of the dioceses serving the western states of Colima, Jalisco and Nayarit with flooding and property damage, but mostly impacted small settlements and rural areas — which were being provided with assistance from parishes diocesan collections. “The evaluation that they’re doing at this time says that there is not a crisis situation,” said Jose Luis Lopez, director of emergency responses for Caritas Mexico, relaying information provided by local Caritas chapters. The aftermath came as a relief for Mexico, which was bracing for the worst. Hurricane Patricia was predicted to bring unprecedented destruction. It also showed the country’s capability in responding to strong storms — which crash both coasts frequently — especially as experts say climate change is likely to cause more intense hurricanes with increased frequency. “What has surprised us was the rapid increase (in the storm) to the point it reached Category 5 strength,” Lopez said. Hurricane Patricia escalated into a Category 5 hurricane as it moved over warm waters in the Pacific, packing winds of more than 200 miles per hour and making landfall Oct. 23 in the evening hours. It was expected to dump up to 12 inches of rain on coastal communities and more as it moved inland. Lopez credited a quick response by the government and civil protection officials, who issued warnings, opened shelters for those seeking safety and prepared clean-up plans. He also credited citizens, who haven’t always acted with urgency in times of crisis and sometimes stay put due to fears of losing their few possessions to either floods or looters. “In general, we see a population paying attention to warnings,” Lopez said. “As Catholics, as people of faith, we see a population that was praying,” he added. The storm struck Mexico as one of the strongest hurricanes ever registered in the Western Hemisphere, but it avoided populated areas by arriving in a region between Manzanillo and Puerto Vallarta known as the Costa Alegre. It also quickly lost strength as it hit the Sierra Madre. The newspaper La Jornada reported the storm’s strongest winds were concentrated in a band about 30 miles wide — much narrower than previous monster storms. More people also paid attention to the government warnings than in past problematic storms, said Father Rafael Rico, director of Caritas in the Diocese of Autlan, which includes the coastal communities where Hurricane Patricia made landfall. 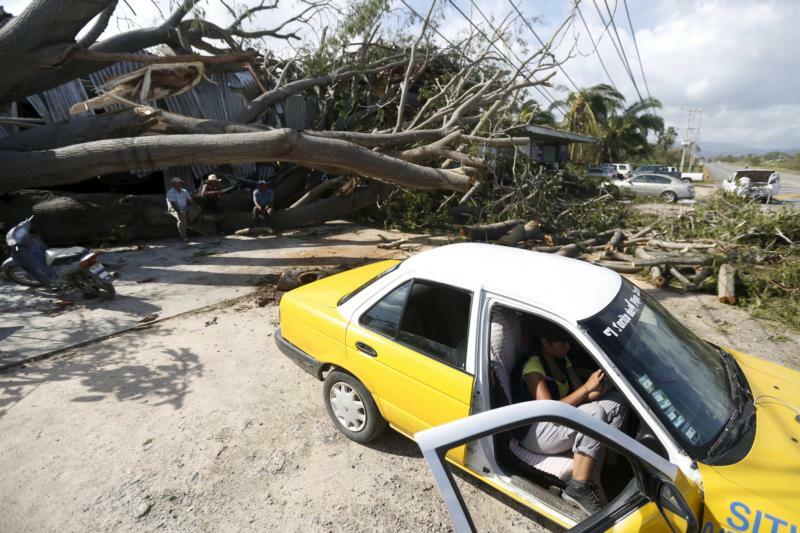 Diocesan priests said the storm hit hardest in poor communities sustained by fishing, coconut groves and banana groves, and that those with the least lost the most as their homes were unable to withstand the strong winds. “There are poor families that have lost everything,” said Father Rico, adding that relief supplies gathered from an Oct. 25 collection would be delivered within two days. Pope Francis published an encyclical earlier this year urging care for the environment and action and climate change. It’s a call Lopez says Caritas in Mexico is taking seriously. “There are issues here that have to do with climate change,” he said. “This situation should make us more attentive because we live in areas where hurricanes occur,” Father Rico added.